Note: This write-up has been rewritten and republished to reflect the updated rules. First things first. I actually made a mistake in February’s forward test since I missed one trade, namely the first one. Sorry about that. I missed that because I was literally only looking forward during the forward test and forgot to look backward. 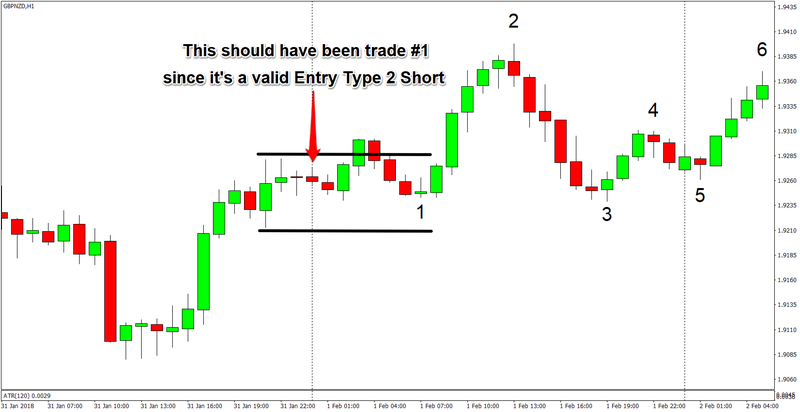 It’s only when I started applying the updated rules that I saw there was a valid Entry Type 2 short (under the old rules), which would have resulted in a full loss. The Variants’ actual performance under the old rules would therefore have been worse. But on a happier note, the updated rules resulted in a solid performance boost for both Variants. And more importantly, the Trailing Variant closed the month in positive territory. 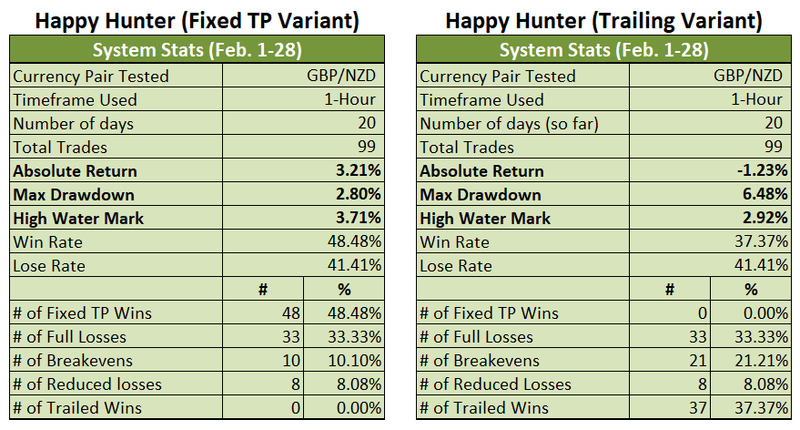 The Fixed TP Variant reached a high water mark of 6.20% but suffered a couple of parting shots near the end and is therefore only up by 5.20% for the month of February (+3.21% under old rules). The Trailing Variant, meanwhile, ended February up by 1.97% (-1.23% under old rules) after surrendering its earlier gains and briefly dipping into negative territory when the system went into a painful losing streak. So are the two variants successful? Well, first recall that I had the following goals when I first laid down my plans in My 2018 Trading Resolution. Both variants did not come close to exceeding the 20% drawdown threshold, so both variants clear that goal. The Trailing Variant’s 5.73% drawdown did make me worry, but it didn’t come close to the 10% “panic level” so I’ll let that slide. Moving on, the reward-to-risk ratio on the Fixed TP Variant is actually less than 1:1 because of the relatively large 12-pip spread. But I’m not too strict on meeting that goal because (1) the reward-to-risk ratio would be better than 1:1 in a zero-spread environment and (2) the system makes up for it by meeting the first bonus goal of having a win rate of 50% or better while also having a low lose rate to boot. As for the Trailing Variant, well, this goal is not really applicable since the Trailing Variant has no set TP. Next, both variants use the same entry methods, which is why they’re variants and not separate trading systems. With that said, both variants opened at least one trade per day, so I meet my third main goal. As for my other goals, the Fixed TP Variant meets my goal (for now) of having no losing month and it almost met my bonus goal of having no losing week since 3 of the 4 trading weeks in February were profitable. 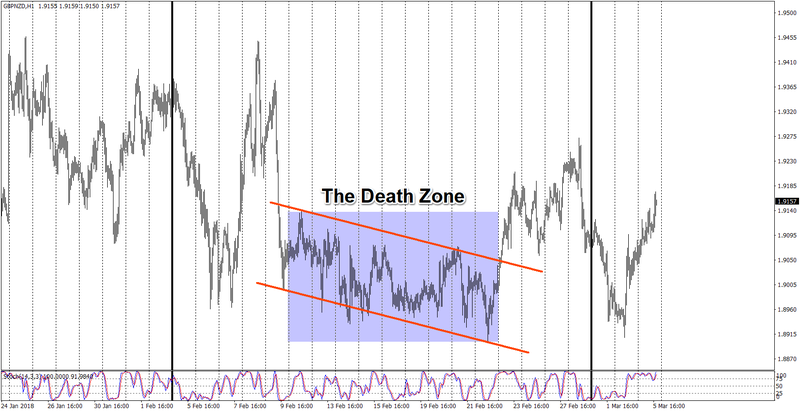 The Trailing Variant, meanwhile, also met that goal, thanks to the new rules. Under the old rules, the system would have been down by 1.23% for the month. 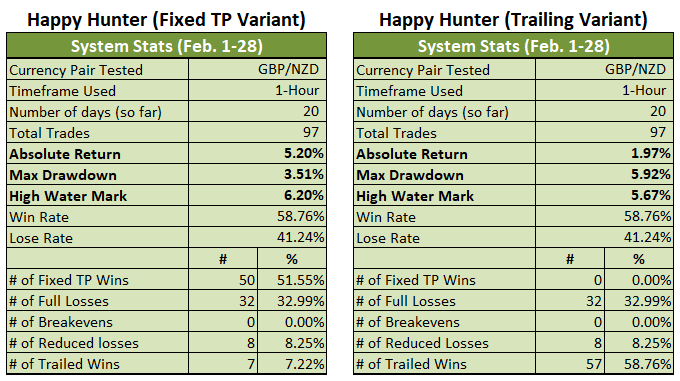 Both variants started the month on a strong footing and the Trailing Variant even initially outperformed the Fixed TP Variant when February started with favorable trading conditions. However, trading conditions quickly deteriorated and stayed that way for nine consecutive days, which is when the Trailing Variant suffered a painful 5.73% peak-to-trough drawdown that forced the system to surrender its 5.67% in gains and then briefly dip into negative territory. 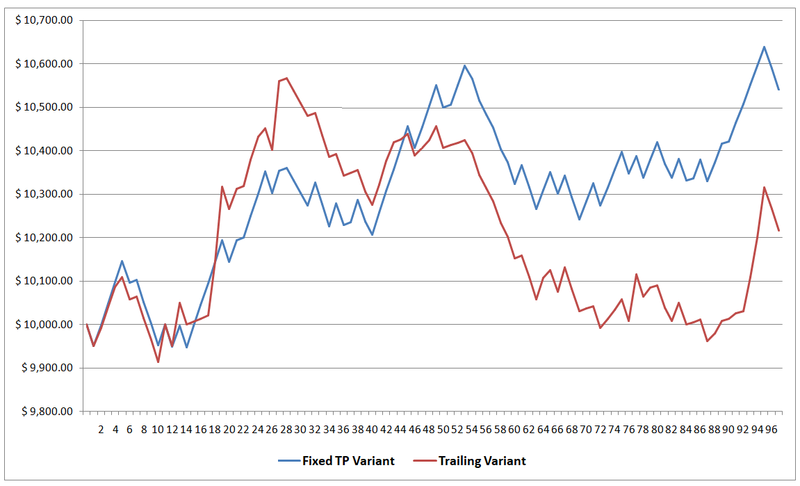 The unfavorable trading conditions also took its toll on the Fixed TP Variant, but because of the variant’s design philosophy of taking profit at a statistically probable price level, the Fixed TP Variant did not suffer as much and survived well enough until trading conditions became favorable again. That’s not very surprising. After all, if y’all can still recall when I compared the backtest results of the two variants, I noted back then that I still want to forward test the Fixed TP Variant since it has an advantage when it comes to capital preservation. And that clearly showed during the prolonged period of unfavorable trading conditions in February. In fact, the Fixed TP Variant not only survived but thrived as well. Anyhow, the Fixed TP Variant is meeting my mains goals without a problem and it’s even met or almost met some of my bonus goals despite the unfavorable trading conditions, which is just awesome. As for the Trailing Variant, it’s also meeting my main goals, thanks to the updated rules. Under the old rules, the system would not have been considered a failure since it met my critical goal of not exceeding a peak-to-trough drawdown of 20%. Even so, the 1.23% in losses for the month did leave a bad aftertaste, which is partially why I was motivated to introduce the tweaks. Anyhow, it’s back to the daily updates tomorrow. And as always, I enjoy your feedback. So if you have any questions, or if you see a possible error in my work somewhere, or if you just want to say “hi” then don’t be shy and write a comment down below!